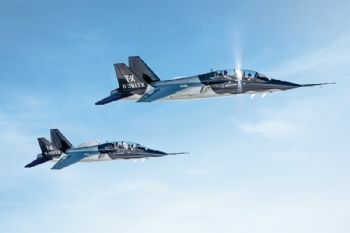 US Air Force pilots will soon train for combat with T-X jets and simulators from Boeing, following a $9.2 billion contract for 351 jets, 46 simulators and associated ground equipment. Leanne Caret, CEO (Boeing Defense, Space & Security), (www.boeing.com) said: “This announcement is the culmination of years of unwavering focus by the Boeing and Saab team. Boeing and its partner Saab designed, developed and flight-tested two all-new purpose-built jets to prove the system’s design, repeatability in manufacturing and training capability. Håkan Buskhe, CEO of Saab, said: “This selection allows our two companies to deliver on a commitment we jointly made nearly five years ago. Boeing can now begin placing orders with its suppliers, including Saab. More than 90% of Boeing’s ‘offering’ will be made in America, supporting more than 17,000 jobs in 34 states.